This blog is intended to provide some comment on current issues, especially those that either include commentary on statistics or those that relate to statistics I gather for my own purposes. �I am experimenting with new Govt data published by Stats and MBIE, there is a lot of useful information, especially related to what I call affordability - this data could be used carefully to justify prices, I plan to develop a few charts to show how. Charting the YoY growth in number of active bonds from the published data of MBIE, it is obvious that apart from some short periods of dips in the past, the growth rate is a relatively constant rate of ~12,000pa. �All the previous dips in supply have been during public discussions about CGT. At no stage has the growth become a loss, ie dipped below zero. �The worst period was in August 2013 when only 724 active bonds were added to the national rental pool. The discussions about CGT do not appear to have had any influence in Auckland, Waikato and Canterbury. �It is not obvious why, but there is a large dip in Auckland in late 2011, the only discussion at that time I can see on Landlords.co.nz�is about dwelling purchase price growth starting again, I suspect this may be the reason but do not know. Notice Auckland stock increases about 4000pa, with a short oversupply in 2008-2010, followed by a severe dip 2012 to 2014, then another rise in 2014-2018. �A linear trend model shows the Auckland line being almost flat about 4500pa, rising from 4250 to 4750 over the 20 years, ie with 150,000 rentals in Auckland, that is about 3%. Has Wellington bounced back in the latest data as people believe CGT looks less likely to fly? 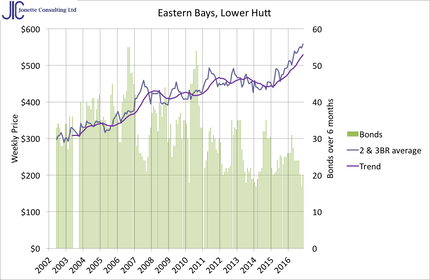 However if Wellington had continued to grow at 1400pa, there would be more than 4000 higher today - possibly hinting at why there is a shortage of about 800 rental properties now showing in weekly stats? There are many calling out CGT for potentially causing a loss of rental homes on the market, this data suggests that the market is sensitive to discussion in some regions, but the lack of sensitivity in other regions suggests it will just not happen. Overall there has not been a reduction in rental stock, however a reduction in rental stock growth in Wellington and Bay of Plenty has definitely led to increases in prices. 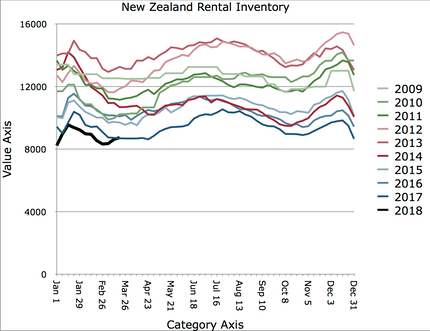 �Current rental listings (inventory of vacant houses) in�Wellington and Bay of Plenty�is severe. Lots of new subscribers this week, many from Auckland, as expected, but a good number from Hawkes Bay, so expect an update about HB soon. Having looked at quarterly�NZ wide rents as a proportion of weekly household income I decided to take a compare at the Territorial Authority (TA) level of Auckland. �Unfortunately Stats do not supply incomes split to this level - yet, so I have to use all-of-Auckland incomes. People tend to be limited in their choice of the rental they pay based on the income they have, so the percentages have stayed relatively constant over the last 20 years. � There may be some recent reductions, maybe as transport costs have reduced, but only after increases in the mids 2000s. �The TAs can be divided into three groups based on the distance out from the central city - although North Shore is clearly seen as part of the central city for rents now. Rents based on MBIE Quarterly Detailed Mean Rents by TA (from active bonds) and Average household income from Stats Dept, including income from wages and salaries, self-employment and government transfers. However the trend is now down. MBIE publish the number of Active Bonds, this is the number of rentals with a bond registered by MBIE at any one time. �The data is monthly. International research on the state of equilibrium, ie when demand is equal to supply is normally reached at 3%. �This will depend on turnover in any area, so is not necessarily the best comparison. It is quite clear that Auckland is very much in a state of equilibrium and has been since 2014/15, a point frequently obvious in many other charts I produce. �Canterbury has come to the end of the earthquake effect by all appearances, but stability is yet to show. �On the other hand Wellington, Waikato and Bay of Plenty are very short of rentals at 2% or less, we also know that from other data.